I’ve been lucky to have seen some pretty amazing places in my travels – turquoise oceans, glistening skyscrapers, jagged mountain peaks. But one place left such an impact that I really find it hard to describe: Angkor Wat, the remains of an ancient kingdom outside the Cambodian town of Siam Reap. Siam is a very touristy town, unfortunately, but still you get a sense of history and Cambodian charm wandering down dusty lanes and exploring some of the unique (read: odd) gems and treasures for sale in the city’s many markets. The ruins are just a few miles outside of town, and you can explore them by car, tuk-tuk, or bike. If you’re here in summer, I’d advice to skip the bike – while it sounds fun, I’m not sure most would consider biking for 10 or 20 miles a day in searing heat and sunshine to be a vacation. 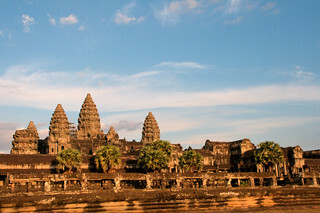 Angkor Wat is the name of this complex, and the name of the most famous (and largest) temple. But there are hundreds of others. As you arrive at the Angkor Wat complex, first impressions run very high – this is where the mind-blowing experience starts. You see, the old gates to the city of Angkor Wat, which ones one of the largest and most expansive cities in the ancient world, still exist. Across a river, a pair of snakes lines the dirt road where you drive under a set of foreboding faces that overlook your entry into Angkor Wat. It truly is incredible. Driving for miles and miles, our guide reminded us that the jungle had reclaimed this land – once it would have been a road through a bustling city. Hard to believe. And then, we rounded a bend and reached another river – larger than the one before. Except this time, it wasn’t a river. This expanse of water that stretched as far as the eye could see from left to right was the moat for the massive temple on the other side, Angkor Wat – the temple whose peaks and columns we couldn’t even see yet. Small obviously wasn’t a part of Khmer architecture. 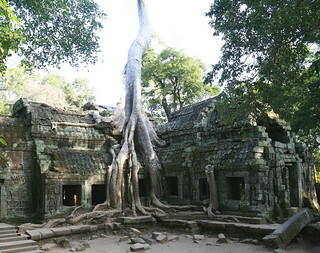 Ta Prohm – one of the more experiential temples. * Bayon: They call this the temple of faces, because there are faces everywhere! Many of them are degraded which is a shame, but just close your eyes and imagine what it must have been like in the day. * Ta Phrom: This is a temple many will be familiar with, perhaps even more so than Angkor Wat itself, because this is where Angelina Jolie filmed her famed scene in Tomb Raider. There’s no trap door, but the trees wrapping around the temple walls (which actually help the structures stay strong) are exactly like you saw in the film. * Presh Ko: An out of the way temple that has some very exquisite carvings and a wonderful reddish tone to the façade. * Preah Khan: I love this one for some of the many statues, who look like they could easily come to life and attack. * Bakong: This temple looks like a math whiz has had his way with the architectural features. Worth the climb up but whew the stairs are very, very tall and steep. Don’t forget to bring water and a snack with you, as exploring the site is somewhat tedious. If you have a guide, they’ll probably bring water, and they’ll also suggest a midday break for you to return to the hotel for a snooze, a meal and a break from the sun, which is relentless in Cambodia. Just a quick note on getting to Siam Reap. To be brutally honest, the best way (and relatively affordable) is to fly. You can get ground transport from any of the Sunshine destinations in Thailand, but to say that the roads are rough is being kind. If you’re in Phnom Penh you can also get water-based transport – I skipped this option due to time, but many say it’s quite an experience.